"Creativity is the power to reject the past, to change the status quo, and to seek new potential. Simply put, aside from using one's imagination - perhaps more importantly - creativity is the power to act." Ai came of age as an art student in 1990s New York. A time and place where the more outrageously anti-authoritarian and oppositional the statement, the better. He then returned to China, an environment far less open to such views. In Ai's words, "China and the U.S. are two societies with very different attitudes towards opinion and criticism." He saw the difference, and refused to conform. He is an artist who actually put his life on the line to defend freedom of expression. Ai was a professional blackjack player for a brief period early in life. His work is about risk (personal, professional, and political). It is also about testing the limits of freedom. His work is designed to remind us that risk-taking is an essential form of exercise in a free society. Government spying, a hot topic in contemporary art lately, is not some futuristic idea but a fact of life for Ai. Under government surveillance for almost a decade, he has produced some of the most thoughtful work on this contemporary topic that is just as important in current popular culture as the hippies were in the 1960s or the feminists in the 1970s. Trained in the West, Ai is intimately familiar with Conceptual and Minimalist traditions, and combines them. In his refusal to pleasure the eye, he is the opposite of Jeff Koons, his equally famous contemporary. In their visual austerity, Ai's pieces are closely aligned with the work of other global activists, among them David Hammons, Robert Gober, and Doris Salcedo, whose large-scale projects call attention to weighty social issues, breaking free from the confines of the gallery and the museum, and bridging the gap between the visual and the social. Ai said his father, the poet Ai Qing, was his single greatest influence. When the artist was a year old, the family was sent to a labor camp, then to a rural village where Ai Qing was forced to clean communal toilets. Ai said his father "as a poet, as an artist, [he] worked so hard at first, and it was very impressive...and I think that the only rewarding feeling he could get was to make the toilets so completely clean. That act influenced me a lot...So, you know, I was born radical, I did not become radical." In what first appears to be a classic tourist snapshot, Ai sticks his middle finger up at Tiananmen Square Gate. Also known as the "Gate of Heavenly Peace", and formerly the front entrance to the Forbidden City, this was also the site of the brutal massacre in 1989 in which state soldiers shot peaceful protesters. The Beijiing government still refuses to discuss it, and censors all footage of the event. Study of Perspective Tiananmen Square was part of a series begun in 1995 and completed in 2003. The Eiffel Tower in Paris, The Reichstag in Berlin and the White House in Washington D.C. all get the same treatment in these parodies of Renaissance perspective. The central rule that objects closer to the eye must appear larger is being used to showcase an offensive gesture expressing Ai's basic disdain for state power, which is by no means limited to China. When Ai was arrested and interrogated by the Chinese police in 2011, his interviewers limited their questions, however, to this particular photograph, demanding an explanation. Ai stated that he had meant to target "Feudalism", explaining that the gate had been built by a Ming Emperor. While Ai's interrogators could not acknowledge it, they were no doubt aware of another layer of visual symbolism. In its resemblance to "tank man", an unidentified protestor photographed in 1989 facing a line of tanks, Ai's finger, standing alone against symbols of state power at the center of this image, is a provocative stand in for a figure strictly banned in the Chinese media, and therefore truly and brilliantly provocative. This work compresses a ton of traditional pu'er tea leaves into the space of one cubic meter. Aesthetically, it recalls the glass and steel cubes of Minimalism. Donald Judd and Robert Morris were among the artists Ai admired. At the same time, it is made out of tea (one smells its pungent odor from afar) setting it apart from anything a Minimalist would make. Much tea in China is still produced in compressed cubes, so this is also an enlarged form of an everyday domestic item. While in the West, drinking tea (especially from Chinese porcelain) has historically been a status symbol, tea is the everyday drink in China. The brand here is one of the most common. In a much less dramatic way than Dropping a Han Dynasty Urn, Ai's act of making tea into Minimalist sculpture calls attention to divisions between past and present. Ai's awareness of Western trends and Eastern ideas locates the work at the center of a global matrix crisscrossing the world, a persistent feature of his approach as an artist. Both a stylized representation of an earthquake and an image of its effects, Straight is a statement about a specific instance of governmental corruption and negligence. The province of Sichuan suffered massive casualties in an earthquake of 2008, leaving 90,000 dead or missing. Over 5,000 were children killed when poorly constructed schools collapsed on top of them. Ai, a self-taught architect, was outraged to discover that this could have been avoided. Both a memorial and a call to action, Straight is part of the artist's broader effort to hold the Chinese government responsible and urge it to take preventative steps to avoid future disaster. It took him four years to complete this monumental floor sculpture --almost 40 feet long and 20 feet wide - weighing 200 tons. To construct it, he collected the bent and broken steel reinforcement bars that were part of the badly built schools. He commissioned metal workers to straighten and mend them until they looked as they would have before the earthquake. He arranged the bars in waves that resemble the oscillations in an earthquake on a seismograph. The fissures between them resemble fault lines. The thousands of individual components reference the individual lives lost, a typical feature of Ai's symbolism. The Chinese government did not appreciate the attention the artist drew to this national embarrassment and this marked the beginning of an especially turbulent period in Ai's adversarial relationship with Chinese authorities. In 2010 Ai filled the enormous Turbine Hall of London's Tate Modern with exactly 100,000,000 porcelain sunflower seeds, each made by a craftsman from the Chinese city of Jingdezhen. Hundreds of individuals had therefore been hired to produce by hand what appeared to have grown from nature. Booths on either side of the exhibition allowed viewers to appear on video and pose questions for Ai, to which he responded on the Tate website. While the meaning of this work remains an open question, the label "Made In China" will never look quite the same after experiencing this exhibit. It evokes complex associations, connected to Chinese history and culture. Like Ton of Tea, it is made from a substance (porcelain) made for export that has long sustained the Chinese economy. Questions about how it was made led the audience to greater understanding of contemporary mass-manufacturing practices in China. Much is still made by hand in an economy where machines are expensive and labor (and human life in general) is cheap. The artwork, therefore, was a clever pretext for calling attention to a politically sensitive issue. The sunflower is an important Chinese communist symbol. Chairman Mao compared himself to the sun and his people to sunflowers. In Beijing, sunflower seeds are sold by urban street vendors. For Ai, a Beijing native, they evoked happy memories of wandering the city with friends. By 2010, however, due to a series of fines, arrests, and brutal beatings, he was essentially a prisoner in his own city. In this light, his seeds, cast on the ground, evoke an oppressed, downtrodden society, far from the ideal that Mao described. 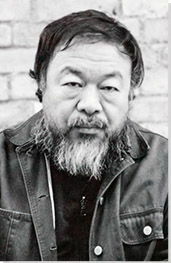 In 2010 the Beijing police installed security cameras in his home and studio. These track him from room to room, and even outside. They also closely monitor his posts on Twitter and Instagram, as the artist put it: "In China, I am constantly under surveillance. Even my slightest, most innocuous move can - and often is - censored by Chinese authorities." The artist, in turn, tracks the surveillance cameras, vans, and plain-clothes police officers that monitor his gates. Surveillance Camera, an austere and quite beautiful marble sculpture, reminds us that the artist is watching those who watch him. Like tea or porcelain, his choice of medium has significance. A surveillance camera in marble (literally, set in stone) reminds us of the omnipresence of this feature in Ai's life, as well as its role as a stand in for an authority, like the statue of a Roman emperor. Set on a plinth at eye level, the resemblance of the shape to a head and shoulders is a visual twist characteristic of Ai's broader sense of humor about the absurdity of his situation. In 2012, he set up "Weiwei Cam", broadcasting a live feed and invited his followers to view him at work and going about his business, mimicking the intrusion of Chinese officials into his private life, but here the viewers watch him at his invitation. Authorities quickly shut it down (within two days), but it remains a testament to Ai's persistent wit, and unwavering commitment to holding his government publicly responsible for its intrusions into the lives of its citizens. "He Xei" means "river crab." In a complex system of homophones designed to evade government detection, it also means "censorship." Thirdly, it sounds like the term for "harmonious," and a well-known Chinese Communist Party slogan prizes the "realization of a harmonious society" - this is often the reason given for limiting access to information. In a clever play on words, this society of crabs/censorship is far from harmonious. Cast in black and red (the colors of the Chinese Communist Party) these hard-shelled creatures trample each other. The few that escape the pile seem especially vulnerable. In 2014 a visitor accidentally stepped on one and crushed it, an unintended metaphor for the consequences of resistance. Like his Sunflower Seeds, this pile of 3000 individually-crafted porcelain crabs is a societal metaphor and a scathing indictment of the ruling party. There is also an autobiographical dimension to the work. A year earlier (2010) Ai was informed that his newly built studio would be torn down (authorities claimed he had not had the right permit). In response, Ai publicly announced he was holding a feast in celebration of the destruction of his studio. He invited 800 people and ordered 10,000 crabs. Officials, who understood but who did not appreciate the gesture, placed the artist under house arrest. While unable to attend the event, he was still able to broadcast it internationally and in near-real time. A scathing metaphor for the absurdity and brutality of a system that oppresses its citizens, this work highlights the theme of resistance in Ai's art.